Ocean Front building on Boardwalk all expected Amenities HDTV Wi-Fi Gas Fireplaces No rentals to groups under 25. Outstanding Features of this Condo: This 2100 sf condo was brand new in 2008. What our guests RAVE about is the Balcony offering views to all 3 bedrooms. Fantastic views in all directions This is a beautiful newer building in downtown location with a private secured garage. This is not your standard OC condo, it offers vaulted ceilings, large living area, large kitchen, master bedroom and 3.5 spacious baths to make for a relaxed easy going vacation experience for your family! Luxury features galore! The gourmet kitchen offers convection oven, large refrigerator with full-width freezer. Fully equipped with counter top appliances. Huge Master Bedroom Suite: The Master bedroom suite provides a large sanctuary to get away from it all! It features a ceramic master bath with jetted tub and separate shower with sink and vanity. Master bedroom has king bed set with 50" HD TV/DVD over a gas fireplace, w/ Blu-Ray and HD cable box. Three large sliding glass panels provide stunning views of the Ocean, Bay and Assateague Island . There is a large chair with table to allow you to enjoy view, read or view the TV. Private sliding door access the balcony. Great place to retire and relax from the days activities! Our Guests tell us they just live on the balcony, drinking in the Views, Ocean Air and Sun. As much as we try we cannot capture the view with pictures. Downtown Location: One of the biggest issues with the OC boardwalk is parking! Solved with the private garage! You can park your car and walk to all that you may want to do. All the shops, amusements, bars, and restaurants are a short walk away. Within 5 blocks are jet ski rentals, deep sea fishing charter boats, over a dozen restaurants, miniature golf, the beach, the amusement pier with rides for all ages, video arcades, ice cream, candy, and t-shirt shops, Thrashers fries and Fisher's Popcorn. All right at your door step. Best supermarkets are across the bridge but less than 2 miles away. There are many public golf courses just across the Rt. 50 bridge, with in a 5-10 min drive. This Condo Sells out every summer early. Favorite of returning guests! Book now to assure a vacation to remember! Conard and Martha purchased this condo for family and rental purposes. They enjoy using the condo and sharing the great experience it offers to guests as well. Please try it, you will love it! 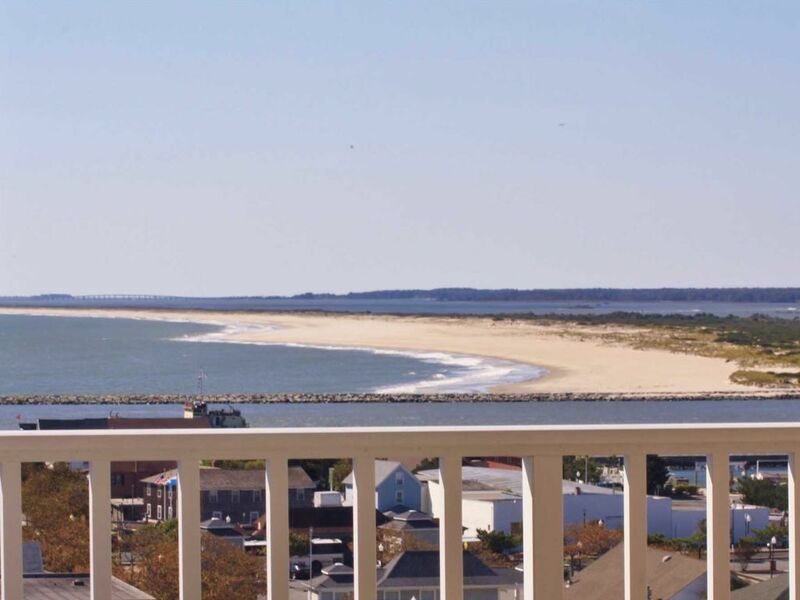 The primary reason we fell in love with Belmont 904 was the incredible view of the southern tip of Ocean City and Assateague Island beyond the inlet. To be able to see this whole vista from every room is an amazing experience. Nearly every visitor to our condo says it is the best view in Ocean City, hands down. The 60 ft south-facing deck, with entrances from each room, allows that view to flow into the living space, permeating the condo with light and a sense of peace. You can sit on the deck and look down on the boardwalk, the beach, rides on the pier, boats going in and out of the inlet, waves lapping up onto Assateague Island, and the sunset at the end of a satisfying day. Living in a penthouse condo places you at the end of a quiet inside hallway, providing a quiet sanctuary from the crowds. Yet, a walk on the boardwalk (with a stop for Fisher’s famous popcorn or Thrasher���s legendary fries) is just down the elevator and around the corner. Vaulted ceilings in the living room and master bedroom, generous-sized second and third bedrooms, a computer nook all provide a sense of extra space. Large balcony that runs the whole length, not the width of the condo allows great outdoor summer experiences. Views of the fantastic sunsets, the wild ponies on Assateague Island National Park, and the long stream of fishing yachts coming in and out of the inlet to name a few. The Belmont building is new, modern with every modern convenience. The gated garage is unique in down town Ocean City. The roof top pool and sun deck offer great views as well as some wind protection on windy days on the beach. It truly is one of the sought after destinations in Ocean City with huge demand from guests to stay again next year. Gas Fireplaces in both Living Room and Master Bedroom. HD TV in all bedrooms and Living Room. 50' HD TV with HD cable service in Living Room. 50' HD TV in Master Bedroom. Linens available upon request for extra charge. Building has 2 elevators. The condo was definitely all we had hoped for. It is large, well appointed, plenty of room for our party of 5 adults. It is located central to restaurants, the boardwalk, Assateuge Island. Would definitely rent again. Very clean and nice place for family reunions, We have several kids and were worry about being in a condo may bother neighbors, so we choose this place for off season, turns out to be perfect choices! Would definitely come back. Property was nicely appointed, very good view, clean and comfortable. The entire transaction for the rental was seamless. The condo was amazing and the view was also amazing!!! Beautiful condo with spectacular views. It was clean and well-equipped with 2 parking spots in garage. Looking forward to a future stay! The condo was beautiful. It was very clean and very comfortable. The living room had enough seating for all 7 of us to sit comfortably. Every bedroom had a full bath and the kings size beds were very comfortable. The bunk bed was fine but not as comfortable as the kings were. We chose the option of bringing our own sheets but didn't find that much of a bother and it was nice to sleep on familiar sheets. The views were spectacular and much more interesting because they do not face the ocean side of the city. There was no noise from the boardwalk which was a huge plus. We could hear the screams from the rides but they were off in the distance and not disturbing. Would definitely stay here again. Thanks for a wonderful vacation! The perfect location for fun! The beach is the widest in the city, with plenty of room for your umbrella, chairs and towels. Volleyball nets are directly in front of the building for sports lovers. Fish off the Route 50 bridge 3 blocks away. Work out in the fitness center, relax in the Sauna or stroll the beach and boardwalk. Head up to the Jolly Roger amusement park 4 miles away. Ride a bike on the boardwalk before 10am and take in the beachfront views. Walk on the boardwalk to a favorite restaurant or bar. Take a drive up to the Delaware outlets for sales tax free purchases. Drive to the national park on Assateague island, view the wild ponies and wide open beaches. Spend a morning renting a wave rider on the bay side, go para-sailing walk 2 blocks the dock where the large fishing boats come in around 4pm. See the catch of large tuna, marlin. So much to do and so little time!